Isn't this a sweet basket? Each side is a little over 2.5" high making it just right to hold a bunch of wrapped candies for a picnic or hostess gift. 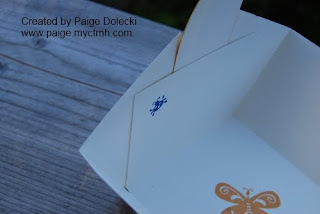 This 4th of July I made one with blue paper and stamped the inside with all sorts of 4th of July stamps and wrapped Smarties candies with red paper to look like firecrackers to give to a neighbor who hosted a BBQ. I forgot to take a picture before giving it away (don't you hate it when you do that?!?). 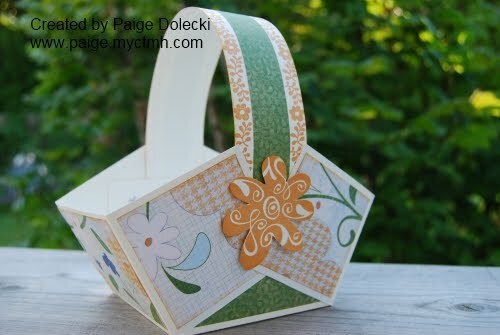 Anyways - this little beauty was a project at my July Stamp Camp. A lot of people went for a little bee instead of the spider. I'm not a spider fan - I tell my kids if it crosses the threshold of the the house then it gets killed, if its outside it can live a full and happy life (my one exception are bees - those I capture and release) - BUT I do like this little guy. He's such a happy little spider! Hmmm...maybe I've been looking at it wrong - LOL! For some reason it looked spidery to me but now when you say ladybug I'm seeing that too! I have a couple extras cut out and ready to put together. I'll do one and take photos for a tutorial later this week - today I'm committed to a kid summer fun day! Thanks Paige. I just wasn't sure if you purchased a template somewhere or found it via another link. I'll watch for the upcoming tutorial! Thanks again!